When we started planning the first truly integrated version of Visual Studio (prior to that Visual Studio was predominantly a collection of tools boxed together) we wanted to help developers get started with the new version. To do this we introduce a common start page for Visual Studio. The goal of this start page was to provide a location, available when the product first started, for the user to either find out about Visual Studio or to easily get back to what they were working on. We also added some other features to this start page such as the ability to inspect the XML Web Service endpoint you had created and access to community provided online information. Users also had the ability to set their profile from the start page to enable them to shift through key bindings and window layouts. This was because our research at the time showed that over 60% of our customers used multiple Microsoft development tools and each of those had a different binding/layout so we wanted it to be easy for users to make Visual Studio feel comfortable. By 2003 we had heard from developers that the most useful things we were showing with Visual Studio.NET was the project and solution Most Recently Used (MRU) list and the online content. For Visual Studio.NET 2003 we removed the tabs that people weren’t using and the new start page focused on the MRU, online information and the user profile. Rendering the start page in HTML made it easy for people to create their own start pages but that led to some issues. As the start page used the same engine as Internet Explorer, users could find themselves with their anti-virus tooling triggering on the display of the start page. Additionally performance was starting to be a limiting factor and we saw more and more users changing the tools-options setting to turn the start page off so that Visual Studio would load faster. We decided for Visual Studio 2005 and Visual Studio 2008 to implement the start page as a custom Win32 component and to display dynamic content only through RSS to decrease the exposure of the start page to threats. We also moved the profile selection into the first start experience as our customer data was showing that people were still using multiple tools inside the IDE but that were no longer switching profiles as much. All of this made the start page faster but it now cost a lot more for us to modify the start page to present new information or to adopt a more modern look. We had introduced the Windows Presentation Foundation with Visual Studio 2008 and were moving many of the visual components for Visual Studio 2010 over to it. It made sense for us to adopt WPF when we renovated the start page in that release. One of the requirements that we needed to address was the growing number of platforms that Visual Studio could target and how we could most efficient provide introductory information about them to users. We addressed these requirements by using a multi-tab model that presented the relevant platform information in specific tabs. We also had data showing that developers had moved well away from using Visual Studio as their RSS reader so we turned that off and moved it to a background tab to improve performance. With this renovation we also increased our instrumentation of the start page to help us as we moved forward. Additionally the move to WPF enabled us to bring back start page customization and the Visual Studio 2010 SDK included a custom template for start page development. The introduction of the Premium and Ultimate editions and the increased functionality of the tooling they provided led to the creation of a number of “How To” videos that were eventually included on the start page. Based on our telemetry, many of you like these a lot as we’re seeing downloads approaching 950,000 per month. All of that leads us to where we are today. Visual Studio 2013 RC brings a new look for the start page focused on information that people use. 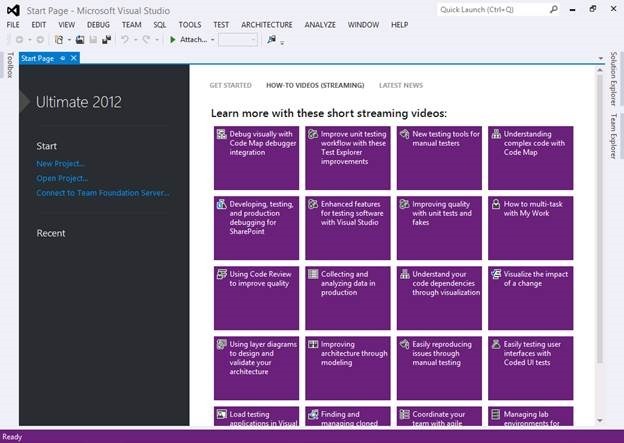 The most popular topics on the Visual Studio 2010 start page were the “What’s new” topics by an order of magnitude over other topics in the Getting Started and tabs. Other tabs had much lower usage but “What’s New” remained a clear leader over other tabs. Customer data also showed that over 30% of our users preferred opening recent projects by going to View-Start Page and then clicking on the MRU over using the File menu commands. Also the number of users who turn the start page off via Tools-Options had now become a small minority of users. In Visual Studio 2013 we aimed for a cleaner look to the start page that makes the acquisition of information easier. The videos in Premium and Ultimate, for example, use easier to see icons that group related topics. Videos are surfaced through an RSS feed that we can update new videos that could previously only be done as part of a Visual Studio Update. Detailed platform information moved to the platform developer centers where developers were already going for in-depth information. This way you can see the “What’s new” together with all the other supporting platform information and sample code offered at that site. From looking at our data we believe that, while the “What’s New” information is used more than any other information, it seems to be less frequently used longer term (it tends to be read only once or twice). However it lives in the most prominent part of the start page’s middle column so there is now an option to relocate it to a less important part of the start page. Lastly, the new start page now uses the system’s default browser instead of the one in Visual Studio. This gives you a higher fidelity experience with the site that you’re viewing. · What information would you like us to display (including non-Microsoft sources)? · If we made it extensible and customizable would you use it? If so, how? Let us know what you’d like to see (or what you absolutely don’t want to see there) and also please download the RC of Visual Studio 2013 and try out the new start page. You can let us know by creating a suggestion on User Voice (in the IDE category) for the community to vote on or by commenting on this post. If you find a bug please use the Connect site to let us know. After the better part of 19 years spent in Visual Studio (and precursor tools) Marketing, Tony decided that he should either make a career of it or try something new. 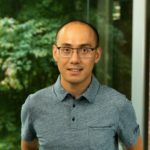 He joined the IDE Services team as a Program Manager in early 2012 and has been working on Visual Studio extensibility and the Visual Studio Industry Partner Program since then. While not known for enjoying pina coladas and getting caught in the rain, his version of paradise would include a cheeseburger.